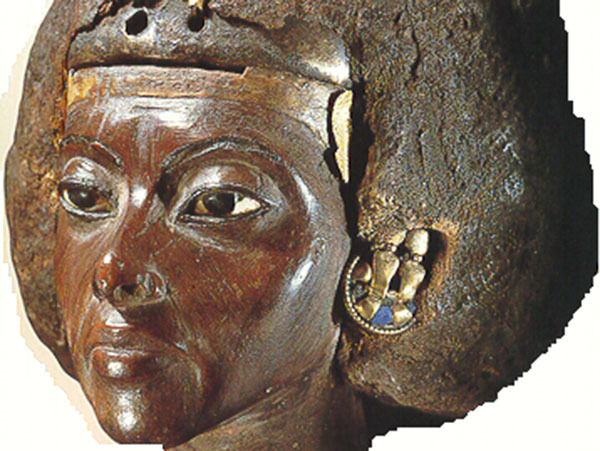 Queen Tiye was a queen of the 18th Dynasty, married to Amenhotep III. Dr. Hawass’ DNA results seem to indicate that Amenhotep and his father-in-law Yuya were related, and this could well have meant that he was his uncle. Despite giving birth to a royal son, Mutemwiya’s position at court was never exalted, and in his 7th reignal year Tuthmosis espoused his younger sister – the Princess Iaret, and she became his Great Royal Wife. It is unclear why Iaret replaced Nefertari as Tuthmosis’ chief-consort, but it is believed that Nefertari may have died. As a Great Royal Wife of the king, Nefertari and Iaret would have worn the royal vulture and uraeus on their crowns, whereas Mutemwiya as a lesser wife would have worn a crown which was adorned with a simple pair of gazelle’s heads. However, as the mother of a royal son, Mutemwiya must have known that one day she may receive the royal honours which she had never had. Tuthmosis also had foreign brides – such as the daughter of Artatama of the Mitanni – a king in modern-day Syria, who had requested the princess several times before finally contracting the marriage as part of the Egyptian-Mitanni alliance, which would continue for several decades and served as a political union against their enemies – the Hittites – in modern-day Turkey. Pharaoh Tuthmosis died in his 10th Year (c.1387 BC) when he was aged around thirty yeas old, after a short but successful reign during which he achieved victorious campaigns over Syria and Nubia. He established a better administrative system over his provinces, and embarked on grand-scale construction projects such as the Temple to Amun-Ra at Karnak. Their son, Amenhotep was proclaimed king at the age of twelve, and Mutemwiya rose into the limelight as Regent of Egypt for her young son who was crowned Amenhotep III. As Regent her first task was to arrange for the state funerals of her late husband, and the princess Tentamun – who died that same year. Her second task was to arrange a successful marriage for her son. Mutemwiya selected a girl named Tiye from the city of Akhmin in Upper Egypt, who was approximately the same age as Amenhotep. Tiye was the daughter of Yuya and Tjuya – two powerful courtiers who rose to prominence during the reign of her late husband, and held various official and ecclesiastical positions. Cyril Aldred suggested the emergence of a matrilineal line of descent during the 18th Dynasty which began during the life of Queen Ahmose-Nefertari (c.1562-1495 BC). Ahmose-Nefertari held various ceremonial and religious titles during her life, and had the ability to pass them on to her female descendants who bore the title Hereditary Princess – Mutemwiya herself held this title, as did Tiye. Aldred proposed that Tiye’s mother – Tjuya, may have been a direct descendant of Ahmose-Nefertari, which may have been the reason behind the marriage. It has also been suggested that Yuya was Mutemwiya’s brother, and that she contrived the marriage to increase the power and influence of her own family. However, during the Tutankhamun Family Project the DNA results taken from the mummies of Yuya and Amenhotep III by Dr. Hawass demonstrated that both shared a considerable number of genetic traits which were consistent with those shared by close relatives. It has not been proven how Yuya and Amenhotep were related, but it seems likely that Aldred’s theory may indeed be correct – Mutemwiya and Yuya were probably siblings. If Mutemwiya and Yuya were siblings, then she may have been the daughter of Yey and Tey – who are believed to have been the parents of Yuya. Grafton Elliot Smith discovered the remarkably intact tomb of Yuya and Tjuya in 1905. On examining the mummified remains, he concluded that Yuya’s appearance seemed rather foreign. The area of Akhmin was populated by Hebrew slaves, and it is believed Yuya may have been descended from Asiatic immigrants – possibly slaves, who rose through the ranks. Yuya became master of the king’s horses and chariots, and this particular skill was introduced to Egypt via Asia – which suggests once again that he may have had connections with The Levant. Due to the fact that Yuya’s titles were generally hereditary, it has been proposed that Yuya was born to Yey – a gentleman who once held the same titles, by his wife Tey. Therefore, Mutemwiya who may well have been the daughter of Yey and Tey may have had Hebrew origins too – although this has not been proven, and until DNA analysis concluded a racial differentiation it is still unclear. A scarab was issued to celebrate the royal marriage between Amenhotep and Tiye, and her family relocated to the court at Thebes to assume more official posts. Yuya rose to the highest ranks at Amenhotep’s court where he was the king’s vizier, and in charge of his horses and chariots and Tjuya received additional religious duties.